If the post on some of the best campsites in Africa peaked your interest, there are a few things you will want to consider before embarking on your next African camping adventure. One is the tent you will choose. There are a lot of options, but most fall in one of two categories: roof top tents or ground tents. If you are driving a 4x4, a roof top tent is the best option. If you are renting, typically they will be available at an extra cost. If you are driving your own vehicle, new roof top tents start at about $1000 through popular companies like Eezi-Awn. You can also find used rooftop tents on classified sites or by asking around at local camping suppliers. We were able to find a used one for less than $300. 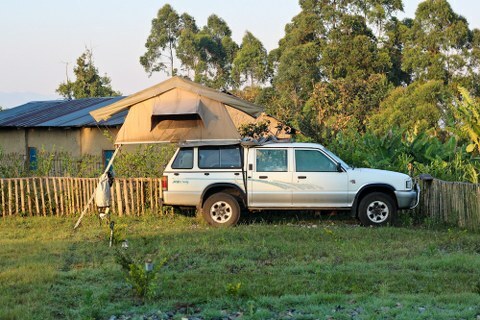 Easy Set-Up Roof top tents are popular in Southern Africa because of the ease of set-up and the comfort they offer. Most have a four-inch foam mattress and have room to leave all of your bedding inside, making setting up camp a breeze. The terrain in Africa varies greatly depending on where you are, with this tent it doesn’t matter if you are in a parking lot, on volcanic rock, or in the desert, you will have the same sleeping experience. Depending on your 4x4 you may be able to fit two rooftop tents on the vehicle, accommodating up to 4 people total. Roof-top Tents Make Your Vehicle Top Heavy Outside of the cost, the only downside is the weight. Rooftop tents are very heavy and can make your vehicle top-heavy. This can be a problem if you are doing heavy-duty 4x4 driving. However, most likely, you will have enough gear in your vehicle that will balance out the weight. If you are backpacking through Africa or traveling with a group, a ground tent will be your best option. Small Size Makes Backpacking Tents a Great Option Lightweight, backpacking tents are available that are easy to carry. Typically these are small, fitting a max of two people. These are popular among people that are either taking public transportation, or on bike or motorcycles because of their size. Three-season tents with a compression sack start about $100. Ground tents are a great option because you can camp almost anywhere there is a small piece of land big enough for your tent. Some campsites won’t have space for a rooftop tent, or an RV, but they’ll nearly always be able to find room for a small ground tent. However, the terrain in some parts of Africa can be difficult to sleep on for long periods of time. If you are traveling during rainy season, even the best tents won’t be able to keep you dry during an African rainstorm. Invest in a Quality Sleeping Pad Almost all of us can handle a few days of uncomfortable sleeping, but if you are planning a longer African camping trip, consider investing in a sleeping pad. There are a variety of options. If you are backpacking, there are sleeping pads you can carry in your backpack and blown up with air. While they aren’t always cheap, you will be thankful for a good sleeping pad when the terrain isn’t so forgiving.